WASHINGTON A massive storm system surged Thursday toward the Mid-Atlantic after causing widespread power outages and flash flooding, but largely failed to live up to its fierce billing through the Upper Midwest. The Washington, D.C., area braced for the storms, and the National Weather Service issued severe thunderstorm watches and warnings for much of the region. Forecasters warned that the storms could produce damaging winds and large hail, and said the threat would run from early afternoon to early evening Thursday. A flash flood watch was in effect. Morning thunderstorms caused relatively minor damage. In Maryland and Delaware, officials reported trees down, roads closed, and tens of thousands of power outages after a line of heavy thunderstorms moved through. In Washington, the Office of Personnel Management said federal agencies in the area would open but that workers would be allowed to take unscheduled leave or work from home. In Delaware, thousands were without power and a 19-year-old woman who works at Plumpton Park Zoo in Rising Sun, Md., was struck by lightning and sent to the hospital. In southern West Virginia, the Roane County 911 center has been evacuated and roads in the Spencer area are closed because of flash flooding. Still, overall, the storms appear to have caused less wind damage than was feared through early Thursday, said Bill Bunting of the National Weather Service's Storm Prediction Center in Norman, Okla. Whether they were as bad as anticipated "depends on where you live," he said. He said thunderstorms took longer than expected to merge into a large line that could cause widespread damage. The merger also happened farther east than expected, which limited the potential for widespread damage in Illinois and Indiana, though those states still had pockets of severe weather. Even before merging, the individual storms remained powerful, Bunting said. Besides reports of damaging winds and preliminary tornado sightings, the weather service has received reports of hail at least an inch in diameter in locations stretching from southeast Minnesota to Virginia, he said. In Ohio, storms with swift, straight-line winds soaked parts of the state, knocking down trees and barns and leaving many without power Thursday as commuters dodged fallen branches on roads and faced backups at intersections where traffic lights were out. Straight-line winds topping 70 mph were reported and more than two dozen tornado warnings were issued as two rounds of storms pummeled the state, but no twisters have been confirmed, said Phillip Johnson, who was part of the team monitoring developments for the Ohio Emergency Management Agency. Play was suspended at the U.S. Open at Merion Golf Club outside Philadelphia less than two hours after the start of the first round and resumed about three hours later. A flash flood watch for the entire state of Pennsylvania was issued through Thursday night. Rush-hour commuters tried to get to work in the morning amid torrential downpours and dark skies that made it look like nighttime. In New Jersey, officials opened the soaked state's Emergency Operations Center on Thursday morning to monitor the storm's progress. The National Weather Service issued a flood watch for most of the state. Forecasters predicted 1 to 2 inches of rain will fall on swollen rivers and streams. As thunderstorms rumbled across the southern and central parts of the state, thousands of residents were left without power. In northern New York, rain sent rivers and streams over their banks, leading to evacuations and road closures. Overnight, thunderstorms that punched through northern Illinois caused significant wind damage, mainly in rural areas west and south of Chicago. The city was largely spared. The weather service said intense winds estimated to have reached 70-80 mph in some areas snapped large trees at their trunks or uprooted them entirely. By early Thursday, though, the derecho that had been forecast hadn't developed. "With each hour that goes by, it's less likely," said Greg Carbin of the storm prediction center. A derecho is a storm of strong straight-line winds spanning at least 240 miles. The systems are distinctive and take on a comma or bow shape, and usually have a large area of very cold cloud tops not typically seen in an ordinary thunderstorm. 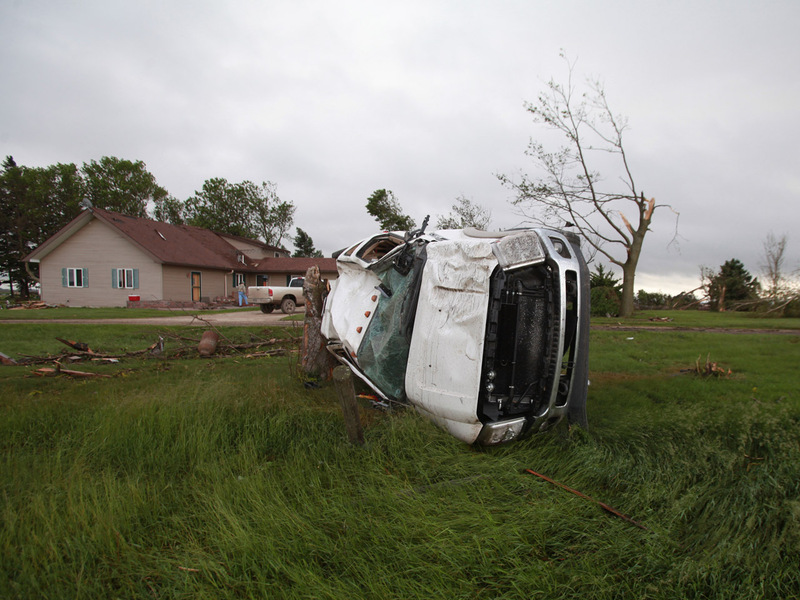 While the Midwest dodged a derecho, several tornadoes, large hail and flooding did some damage Wednesday. In the small town of Belmond, Iowa, about 90 miles north of Des Moines, Duwayne Abel, owner of Cattleman's Steaks & Provisions restaurant, said a tornado demolished part of the building. No one was in the restaurant at the time. "I was, oh, eight miles west of town and I looked toward town and I could see a funnel cloud, having no idea it was exactly where our restaurant was," Abel said. His wife and an employee were able to get out of the restaurant and sought shelter in a basement. Last year, a derecho caused at least $1 billion in damage from Chicago to Washington, killing 13 people and leaving more than 4 million people without power, according to the weather service. Winds reached nearly 100 mph in some places. In addition to the people killed in the storm, 34 more died from the heat wave that followed in areas without power.